Tuesday’s night meeting will be Game night at Battlefield Colorado located at 120 W. Costilla St., Colorado Springs, CO 80903 (Downtown Colorado Springs). Its a pretty big lot. Please arrive about 15 min early (545pm) so we can get our safety brief knocked out and get going. Our troop did this about a year ago and everyone agreed it was the funnest Game night we’ve probably ever had. The cost is about $26 per person for a 90 minute session. 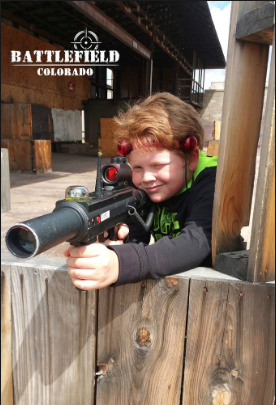 The troop Debit card can pay so scouts and parents can reimburse the Troop (Unless the Treasurer says we can’t 🙂 If you plan to pay with a card then you’ll have to pay Battlefied Colorado Directly. Family, Adults, and Friends are invited to play! Here is the information that we all need to play. Please fill out the waivers below before the event. There are computers there to do it but it will take more time. Player Information, Please Read Carefully! All participants must sign a waiver. Minors will need their own parent to complete and sign the waiver. Your check-in process will go much faster and easier if the waivers are completed online prior to the event. If you or your child have visited before, you should already have a login to our Digital Waiver System, and can quickly login and sign the waiver for this event. What to Wear: Fully closed shoes are required. We play in a urban area with asphalt, gravel, buildings, uneven terrain, etc. At some point, most people will kneel, sit or lie on the ground, so please wear appropriate clothing. Winter Play: Please bring gloves and clothing layers as you would for any outdoor winter sport. Summer Play: No sandals, flip flops, clogs, or other open shoes are permitted. We highly recommend long pants. Arrival Time: In order not to miss any play time, please arrive at least 15-20 minutes before your start time in order to park and check in. If you are interested in weapon upgrades, they are very popular and regularly sell out, so you might want to arrive 30 minutes in advance for the best selection. Directions: Please check our website at the link below for directions: Directions to the Battlefield!ParkingFree parking is available. Please check our website at the link above for parking details. We look forward to seeing you on the Battlefield. If you have any questions, please do not hesitate to contact us!